For many centuries, green tea has been known as a unique and inexhaustible natural source of health, beauty and longevity. Green tea has been used by Chinese and Japanese physicians for more than four thousand years, and still it is difficult to find any other drink or food, which would have more health benefits than this wonderful beverage. Modern scientific researches and studies are providing more and more evidence for numerous positive effects on our health connected with regular green tea consumption. Along with good taste and delicate aroma, green tea has over 300 various useful ingredients: minerals, proteins, carbohydrates, microelements, Vitamines B1, B2, B5, C1, K and P, as well as composites of magnesium, calcium, manganese, phosphorus and other chemical elements. • Preventing cancer is the most valuable therapeutic property of green tea. Specialists underline that drinking 4-5 cups of green tea can protect you from stomach, pancreas, colon, esophageal, bladder and other types of cancer by about 60%. Green tea contains Epigallocatechin gallate (EGCG), an antioxidant, which is extremely effective for protecting your cells and DNA from any changes or damage, and this way preventing formation of tumors and cancerous tissues. 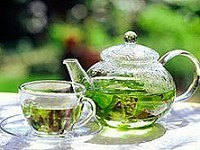 • In addition, regular consumption of green tea can cause remission in patients who suffer from cancer. EGCG inhibits the growth of cancerous cells and creates favorable environment for developing healthy cells. • Another important property of green tea is its effectiveness in breaking down plaque on artery walls, preventing formation of blood clots, stabilizing free blood flow and normalizing blood pressure. This helps prevent thrombosis, which usually causes stroke and heart attack. • Green tea contains a high concentration of antioxidants, which can help increase your good cholesterol ratio and lower your bad cholesterol ratio. • Antioxidants in green tea assist with lowering and soothing the effects of such diseases as rheumatoid arthritis by reducing swelling and toxins in problematic areas of your body. • Antioxidants have excellent antibacterial and anti-inflammatory properties, so they can kill bacteria and infection in your body, prevent cavities and improve your oral health, as well as stimulate and strengthen your immune system. • Polyphenols and polysaccharides that can be found in green tea assist in lowering blood sugar and preventing diabetes. • Antibacterial and antiviral properties of green tea constituents are effective when fighting with some skin problems, including acne. • Recent studies and clinical evidence suggest that green tea polyphenols have neuroprotectant properties and can help in preventing Alzheimer’s disease, Parkinson disease and other neurodegenerative disorders. 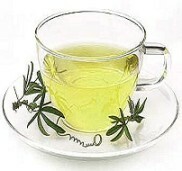 • Green tea has unprecedented properties as an aid to weight loss. Clinical researches of Swiss experts proved that regular consumption of green tea can help in boosting fat oxidation and metabolism, as well as increase thermogenesis and intensify overall expenditures of energy. • Antioxidants and primary polyphenols of green tea have properties to slow down aging and promote longevity. Polyphones in green tea lower the amounts of free radicals in you body, that means better skin, fresher look and fewer wrinkles. Thus, if properly used, green tea can be a real source of new healthy life for practically everyone! However, you must keep in mind that green tea contains great amounts of caffeine, a psychoactive stimulant, which can have negative effects on people with sensitive stomach, problems with kidneys or heart. Also, it is recommended to keep away from drinking a lot of green tea to those people, who suffer from excessive anxiety, panic attacks and other psychological disorders. But still for the majority of people the benefits of this refreshing therapeutic beverage greatly outweigh the effects of caffeine. Do not forget that green tea must be consumed only when it is freshly brewed, otherwise a great deal of therapeutic properties and nutritional values of this miraculous drink will be lost. That is why bottled green tea is considered to have very little amount of natural therapeutic resources. Generally, green tea must be steeped for about 3-4 minutes, but in order to receive the best result, you can follow the instructions of the manufacturer for every specific variety of green tea. So, if you want to live a long and healthy life, drink your favorite green tea every day! Hi there! I like your writing, thank you so much for sharing this info with the community! Regards. Apart from the good propieties of gree tea, we must keep in mind this product combined with other kind of foods constrains the absortion of iron.So it is not recomended to take if you have anemia.